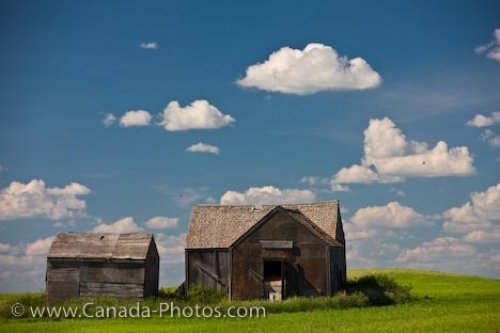 A rustic scene of two old barns in an open field in the Qu'Appelle Valley in Saskatchewan. Two old barns sit in an open grassy field. This rustic scene is in Qu'Appelle Valley. Beautiful blue sky with puffy white clouds add to the scenery of the old barns. It's a warm summer day in the town of Qu'Appelle Valley. Old barns in a field in the Qu'Appelle Valley, Saskatchewan, Canada.